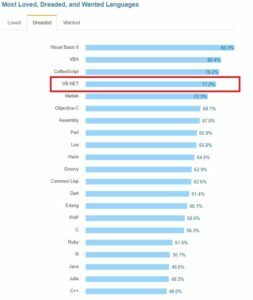 According to the 2017 Developer Survey from StackOverflow, the outlook is pretty bleak for VB.NET… Out of all of the professional developers that participated in the survey, only 6.1% responded as using VB.NET (compared to 38.7% who responded that they used C#). Thankfully, I’ve already done some small projects in C#. There are some annoyances with it (case-sensitivity being the primary one…) but nothing too major.